Argentina’s Economic Recovery Just in Time for the Mid-Term Elections | CALÍBAR el rastreador With the mid-term elections approaching, the Macri administration seems to be heading for another unlikely win if the result of the primaries is any indication of voters intentions on October 22. The primaries, or PASO, showed a highly divided Peronist opposition and thus has allowed Macri’s governing coalition, Cambiemos, to take advantage of that division, contingent upon the PASO primaries being a true indication of what is going to happen on October 22. With the mid-term elections approaching, the Macri administration seems to be heading for another unlikely win if the result of the primaries is any indication of voters intentions on October 22. The primaries, or PASO, showed a highly divided Peronist opposition and thus has allowed Macri’s governing coalition, Cambiemos, to take advantage of that division, contingent upon the PASO primaries being a true indication of what is going to happen on October 22. Perhaps assisting this primary election result was the performance of the Argentine economy, whose monthly economic activity indicator, a proxy for GDP growth, showed a very strong economy at the end of the first half of the year. According to this index the Argentine economy grew 4.0 percent on a year-earlier basis in June. While growth was still weak during the first half of the year, up only 1.6 percent versus the same period a year earlier, it is clear that the Argentine economy has momentum. The Argentine economy should continue to show strong rates of growth during the second half of the year, just in time to support the Macri administration during mid-term elections, which have ordinarily turned against the party holding power. However, as is the case in politics, anything could happen between today and October 22, thus the Macri administration will need to tread very carefully between the very difficult Argentine social and political landscape. Security, street violence and social protests, a high fiscal deficit, high inflation and high interest rates are some of the risks that will threaten the administration as it moves to take advantage of a very fragmented political opposition. The Macri administration has been celebrating the better-than-expected results of the PASO primary elections, which are supposed to elect the candidates who will contest the mid-term elections in late October of this year. These primary elections have transformed into a sort of “survey” on how the parties are going to perform in the upcoming elections. The mid-term elections are normally a very difficult test for the party in power, especially if the economy is not doing well. However, the economy has started to do better, and the expectation is that by October 22, which is when the elections are going to be held, this improvement is going to be more broad based, which many analysts say could further help the Macri administration. Furthermore, mid-term elections are normally a good barometer of whether the current president has any chance of being reelected in two years’ time when the next presidential elections are scheduled. In this sense, and according to political analysts, the results are painting a good future for Macri’s Cambiemos political alliance, and for Macri himself. However, the PASO do not elect anybody into office, they just choose each party’s candidates as well as which parties will participate in the mid-term elections. The parties that receive more than 1.5 percent of the votes will participate in the mid-term elections. This means that everybody needs to wait until the actual mid-term election in October and, for the Macri administration, hope for the outcome the PASO results have predicted. However, in politics, anything is possible, and mistakes made from today until October 22 will be paid for with votes and electoral results. During the mid-term elections there will be 127 seats up for grabs in the lower house of Congress out of 257 seats. That is, almost half of the members are going to be renewed. If the PASO primary results stand (a big if), President Macri’s governing coalition, Cambiemos, could add about 18 new seats in the lower house. This will take the Cambiemos coalition from 86 seats to about 104 seats. Quorum in the lower house of Congress is achieved with 129 members, which means that the Cambiemos coalition will still not have enough to attain quorum. However, analysts say that governing will be easier because it will not need to negotiate with as many opposition members as now. Meanwhile, the Frente para la Victoria (FpV), which is the main Peronist opposition, will go to having 76 members from having 72 members. Smaller parties and some regional/provincial parties will probably elect other members to the lower house as well, which will make the legislative process difficult but not as difficult as it has been during the past two years. The Senate, on the other hand, will renew one third of its members, which is 24 of the 72 seats. The system allocates two senators per province for the party that comes in first and one senator for the second place finish. There are eight provinces that will elect three senators each: the provinces of Buenos Aires, Formosa, Jujuy, La Rioja, Misiones, San Juan, San Luis, and Santa Cruz. Interestingly, two ex-presidents from the Peronist Party are contesting for a senate seat. In the Province of La Rioja, current senator of the province and ex-president of the country, Carlos S. Menem, has been fighting the courts in order to renew his senate seat. A court said that he cannot run again because of a judicial case against him while an appellate court has allowed him to run for the seat. However, analysts in the country estimate that he will probably not be able to assume a new senate term because the court will probably condemn him to house arrest, as he is in his late 80s. Ex-President Carlos Menem comes from the right wing of the Peronist Party. The second Peronist ex-president is Cristina Fernández de Kirchner, who represents the left wing of the Peronist Party, and who won the PASO primaries running for a senate seat from the province of Buenos Aires. Her newly created party, Unidad Ciudadana, which is one of the many outgrowths of the Peronist Party in the country, came in first by a very slim margin of votes, about 0.21 percent difference to the candidate of the governing coalition, Cambiemos. So if the October elections come in like the PASO elections, her party will put two senators in the Senate and the third will be from the Cambiemos coalition. Perhaps this is the mid-term election result that everybody will be following, because the election has the potential to reverse the slight margin Mrs. Kirchner got, and Cambiemos could add one more senator to the upper chamber of Congress. 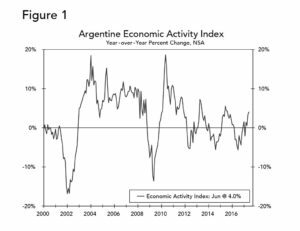 Meanwhile, the Argentine statistical institute, the INDEC, released the results of the June economic activity index, a proxy for the overall performance of the economy. The index shows the economy growing at 4.0 percent on a year-earlier basis in June compared to a rate of 3.4 percent for May. On a seasonally adjusted basis and compared to May, the economy grew 0.3 percent (not annualized) after posting a 0.7 percent growth rate in May. 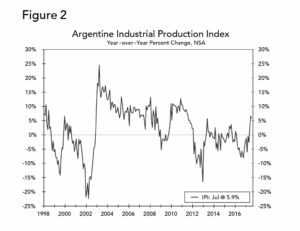 This means that, according to this index, the Argentine economy grew 1.6 percent, year-over-year, during the first half of the year. The country is scheduled to release second quarter GDP numbers on September 21, but this index helps us look at what sectors have been driving economic growth from the supply side. According to the report, the strongest sector in June was construction, which grew 13.2 percent on a year-earlier basis. However, this was one of the weakest sectors last year so the rebound is not surprising and is still not enough to recover from last year’s collapse. The construction sector declined 18.2 percent last year and was up 5.9 percent during the first half of this year compared to the same period a year earlier. The second strongest sector in June was fisheries, which grew at a 7.3 percent year-earlier rate. However, this sector is very small and very volatile. The fisheries sector grew an impressive 23.0 percent during the first half of this year and dropped 5.5 percent in 2016 versus the previous year. In third place came the manufacturing sector and the financial activities sector, both of which grew 6.2 percent in June of this year, year-over-year. manufacturing production was down 13.7 percent in 2016 compared to 2015 and was flat during the first half of the year even though it was strong in June, year-over-year. The financial activities sector was down 12.4 percent for the whole of 2016, but was up 3.1 percent during the first half of this year, year-over-year. In fourth place came the hotels and restaurant sector, which grew 5.7 percent in June versus a year earlier, while the commerce sector came in fifth with a growth rate of 4.4 percent in June. The hotels and restaurant sector was down 7.0 percent for the whole of 2016, while commerce was down 10.4 percent. However, the hotels and restaurant sector was up 3.1 percent in the first half of this year, year-over-year, while the commerce sector was up 0.7 percent during the same period of time. What this indicates is that the economy has been coming back strongly lately, just in time for the mid-term congressional elections and will probably continue to be a boon for the Macri administration as the elections approach at the end of October. Of course, this assumes that the administration continues to deliver on growth and that it does not make any policy mistakes, which is not a sure thing, as it has made several blunders on policy during the first two years in power. Since the beginning of the Macri administration almost two years ago, there has been one policy discussion: whether the administration should shock the system with a strong reversal compared to the policies followed during the previous administrations or, to do so more slowly in a stepwise fashion. The first alternative, analysts contend, would have been characterized by a short term economic downturn with a severe effect in the domestic economy, high inflation in the short run to medium term and then a fast deceleration in the rate of growth of prices, a large devaluation of the currency, and a reversal of all the subsidies that benefited consumption while reigning in fiscal and monetary policies. The second approach, the one ultimately chosen by the administration, was a more moderate and stepwise, or incremental, change in all of these factors in order to disrupt the domestic economy the least. However, analysts were concerned that the moderate approach was going to keep inflation too high for too long due to the need of the administration to continue to keep large fiscal deficits while going into international financial markets to finance this deficit. Although we still need to wait for the results of the mid-term elections on October 22, it seems that the stepwise or incremental approach is paying off according to the PASO primary elections. However, there are plenty of risks threatening a strong performance by the Macri administration. The first one has already been playing out with the disappearance of Santiago Maldonado, a young artisan on August 1. The political opposition to the Macri administration has been using his disappearance to conduct daily protests across the country that have generated, in some instances, serious street fights and destruction of private and public property. This discontent could negatively affect the government’s standing as the mid-term elections approach, due to violence and security issues remaining at the top of Argentines biggest concerns’. Furthermore, high inflation has pushed the central bank to increase interest rates (see Figures 3 & 4) to try to bring down inflation, which is continuing to affect the performance of economic activity and could further negatively affect expectations as the mid-term elections approach. Every analyst in the country knows that inflation is one of the main issues for citizens and one of the biggest problems for the Macri administration. 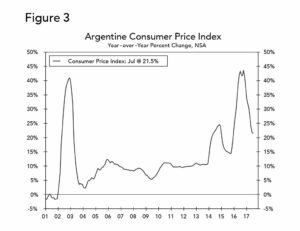 At the same time, the inflation issue is one of the most difficult issues to solve due to the Macri administration’s decision to implement the reforms in incremental steps, which has delayed the “fiscal-day-of-reckoning,” and has continued to keep inflation higher. That is, the incremental approach meant that the fiscal deficit would need to remain high for a longer time, jeopardizing the ability of inflation to come down faster. At the same time, the Macri administration has had to go to international financial markets to finance the deficit, which has increased the debt and could threaten the ability of the government to pay back in the future. The Macri administration is targeting a fiscal deficit of 4.2 percent in 2017 and of 3.2 percent in 2018, compared to a deficit of 4.6 percent of GDP in 2016. These targets are achievable if the economy continues to recover. However, they are still high and would require more adjustments down the road. Analysts believe that if the mid-term elections are positive for the Macri administration then the administration will concentrate its efforts in reducing the deficit. However, we remain skeptical about important improvements on this issue because if the Macri administration has a good result in the mid-term elections, then it will start to concentrate on Macri’s reelection campaign and any intention of fixing the fiscal deficit will probably take a back seat once again. President Macri’s win almost two years ago over the all-mighty Peronist Party was sort of a surprise. However, the recent PASO results were probably even more surprising as it is typical for the party or coalition in power to lose voters during the mid-term elections. It is true, the primaries are not the mid-term elections so we will have to wait until October 22 to see if those results hold. However, they tend to indicate the feeling of the voter and if that remains true in October, then the Macri administration will be revitalized at the start of President Marci’s last two years of his first term. Coming in very handy for the administration has been the relatively strong recovery in economic activity, as measured by the economic activity monthly index for June, which printed a growth rate of 4.0 percent on a year-earlier basis. It is true that the economy managed to grow only 1.6 percent during the first half, but the latest improvement will certainly help the Macri coalition as the mid-term elections approach. Having said this, there are still important risks for the administration, including the tendency to make policy implementation mistakes, which could hurt it in October. 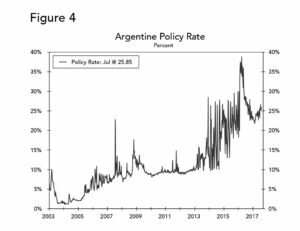 Other important issues are high inflation and interest rates, and high fiscal deficits as well as the sense that security and violence are still a serious issue for Argentines. Thus, while the economy is improving just in time for the mid-term elections the administration will need to navigate a mined landfill. If they are able to manage this period, and they do as well or better than expected in the mid-term elections, then the Macri administration will be in a better position to manage the difficult business of Argentine politics. 1. Alicia Kirchner, the sister of late ex-president Nestor Kirchner and sister-in-law of Cristina Fernández de Kirchner, is the current governor of the Province of Santa Cruz. The province has been immersed in a serious economic crisis for the last several years.